Update: I’ve now posted my second watermelon cupcake attempt. It started with a birthday. Our friend’s son was turning one and he was having a watermelon-themed party. I offered to bring some cupcakes (just 24 – a much easier task than others that I’ve undertaken). My goal was to make watermelon cupcakes that tasted (rather than looked) like watermelon. Both the watermelon syrup and watermelon butter that I prepared as cupcake ingredients had a strong watermelon flavor. When baked into a cake, however, any semblance of their watermelon flavor disappeared in in the oven like lost socks in the dryer. My bright red syrup produced a cake so yellow that it may as well have come from a Duncan Hines box – no red color and no watermelon taste. Even the watermelon glaze that I topped the cupcakes with was a bust; it vanished into the cupcakes as if it never existed. Luckily, I found some cute watermelon candies at the oldest and most esteemed candy shop in St. Louis, Crown Candy Kitchen. Without the watermelon candy, no one would have ever known that my cupcakes were supposed to be watermelon-flavored. Although, perhaps not knowing would have been better – everyone loves a good yellow cake. I’m only posting the watermelon cupcake recipe because perhaps/hopefully some of you will be able to suggest where I went wrong and advise me on how to make a better watermelon cupcake. You’ll note that the title of this post includes the phrase “attempt one.” I plan to have an “attempt two” sometime to try and get it right. I'm only posting the watermelon cupcake recipe because perhaps/hopefully some of you will be able to suggest where I went wrong and advise me on how to make a better watermelon cupcake. Mix in the watermelon syrup, butter, and watermelon butter. Mix the powdered sugar and watermelon syrup together until smooth. Try not to be too downtrodden when it all disappears an hour later. I wonder how you added the watermelon syrup to the cupcakes. In the past, when I’ve tried to flavor cupcakes with syrup, putting the syrup in the batter didn’t make much of a difference. I brushed the syrup on top of the cooked cupcakes before frosting (or skipped the frosting). It soaked into the cake and flavored it pretty well. I’ve also used the drip-the-syrup-into-the-cupcake technique in the past (see my Shirley Temple cupcakes). 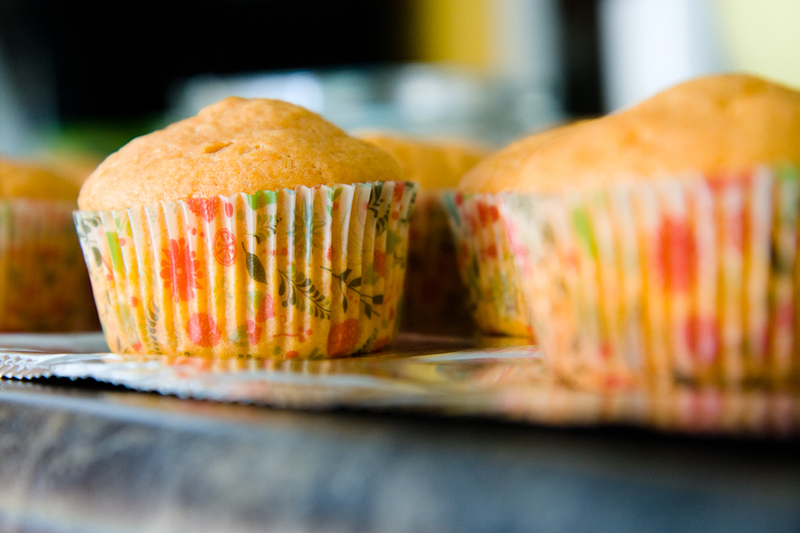 With my watermelon cupcakes, adding the syrup after baking just made them extra wet and soggy – no watermelon-flavor. Maybe if I started with a drier cupcake with no watermelon syrup and then added the syrup, I would have had more success. Failure is rough, but it’s the best way to learn! What if you made it more like a jam cake and used some watermelon jam, which I am sure there is a recipe for somewhere on the internet. I just made some strawberry muffins using strawberry jam and the strawberry flavor really came through. Good Luck! Try watermelon jello. I have had success with that in cookies. See my recipe on my website cakesbyjeannie.com. And, probably you will have to cheat and use food coloring to get the color you want. Good luck. Sometimes its the projects that appear to be easy that end up being the hardest, isn’t it? I am no baking expert, so I can offer no remedy for the cake. But maybe it might be easier to get the intense watermelon flavoring through the frosting, instead of the cake. I realize that’s not exactly what you were really going for, but at least the flavor would be there in the finished cake. After checking online, I saw there is a watermelon extract available. Just wondering if you supplemented what you are already doing with some of that. Ironically i made watermelon cupcakes for Fourth of July. As much as i love using my flavoring oils (Loranne Oils) to make unique taffy and other candies, i have *yet* to find a good fruity substitute for cakes of any sort… in the end you just end up with either no taste whatsoever, or this rediculously STRONG acidic flavor and the *smell* of the fruit o.O Watermelon — being the weakest of the flavors i own — was horrible. Although i believe i’ve seen some watermelon kool-aid recently? (Probably watermelon-lemonade or something though…) you could always try that? Similar to the Jello Cupcakes but without the gelatin’s added texture?? What about a watermelon puree? Maybe straining it if it’s too watery…this might give you some good pink color and watermelon flavor. Watermelon is such a light flavor to begin with. What about a cupcake with watermelon sorbet in the middle? Or using that italian soda syrup, maybe the flavor will be stronger. What about if you used the watermelon butter as a filling? Watermelon is a mild flavor, so I’m not surprised that it didn’t come through as strong as you would have liked. I agree with Yolanda, try to make the flavor the strongest in the frosting. Good luck. I make and use real whipped cream instead of the cool whip, and I bet you could substitute in your watermelon syrup instead of the watermelon jello. I know you were looking for a more authentic watermelon flavor. This pie filling – minus the watermelon chunks, should work quite well as a frosting. As for the cake itself, using a jam or a strained puree are excellent ideas. I’m sure you’ll figure something out and wow us all! You’re kind to share even when you’re not totally happy with the results. I also would have thought the syrup on the baked cupcakes would help to enhance the flavor, but it really is a light flavor to begin with. I wonder if a watermelon ice baked alaska type cupcake would work? I love all of these ideas! You guys are the best! I am feeling inspired to try again soon. I’ll keep everyone posted when I do. I made some watermelon cupcakes last weekend and just used a white cake mix (no time to make them from scratch) with watermelon jello/koolaid. It had a nice taste, not too intense and was a hit with all the kids. Hmmm, I have never made a Dulche de Leche cake but was wondering if the process of poking holes into the cupcakes after they’re cooked and inserted a fairly thick reduction of the watermelon syrup might work? As for the frosting/topping is there anyway to crystallize the watermelon syrup and use it as sprinkles? A genoise cake, soaked in watermelon syrup? Mix the watermelon butter with cream cheese for a frosting. Just had a bit of a wild idea, what about making a watermellon agar agar “jelly” filling & soaking the cake with some watermellon syrup. you will make this work, you are the cupcake queen. Hmm… I’ve done both natural watermelon and well as artificial watermelon. The natural was ok and artificial was fantastic if that’s the flavor you are going for. On the natural I replaced all liquid with watermelon. I tried to strain the juice and add it. The cupcakes tasted ok, but were a little soggy in the middle. What a tough flavor! I have been kicking around the idea for watermelon cupcakes in the back of my head for a while too. I always figured it would be touch since watermelon is mostly water. I like the idea of soaking the cake with a syrup of some sort. 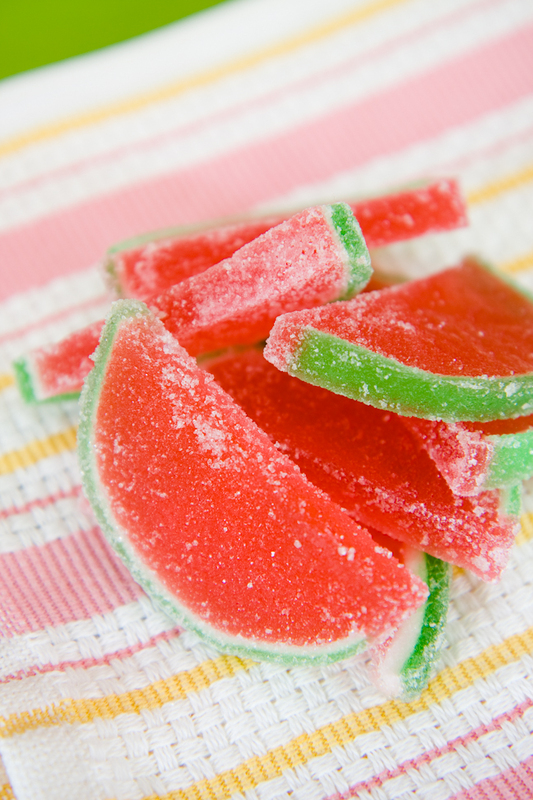 Since they were for a kids party this idea may not work, but what about using a melon liquor in the recipe some where. Maybe it would help bring out the flavor. Good Luck! I don’t have any ideas other than what’s already been shared but I love that you tried so hard to use natural watermelon flavors intead of artificial flavoring that never actually tastes like real watermelon anyway (no offense to readers who have suggested those – all of which I like and enjoy, but I just don’t think they taste like the real thing (=)! Kudos to you! As painful as it was for you to write this both, this was really enlightening for a lot of us. I’ve been wondering about the watermelon-cake thing myself, but never actually came to do something about it. Reading about this is just the thing to fulfill the curiosity in my head! Thumbs up on the effort of not using artificial flavourings. We can all learn something from your attempt. You’ll figure out the ultimate watermelon cupcake. Of course you will! Looks like I came in kinda late. I was going to suggest somehow melting down some watermelon flavored hard candies and then adding that to the batter/frosting. The jello and kool-aid suggestions are good too. Watermelon is so mild that the only way you will get watermelon flavored anything is to make it taste like the fake candy watermelon flavor. Just posted attempt #2 Go check it out. Thanks for sharing your attempt. I have been working on a “from scratch” watermelon cake recipe for my daughter’s upcoming recipe (at her request…), so it was really helpful to read through what worked and didn’t work for you. Although, I am not sure I am any closer to figuring it out, but I have a jumping off point now! I think I will make a drier white cake, use watermelon flavoring and make a watermelon simple syrup to soak it in. Fingers crossed! Put first four ingredients in a medium sauce pan and bring to a boil. In separate bowl, mix cold water and corn starch until smooth. Add corn starch mixture to boiling mixture and stir quickly until smooth. Pour into bowl, cover with seran wrap and let sit over night. Make whip cream with about 2 tablespoons of the watermelon flavor syrup. Pour the gel into a mixing bowl with wisk attachment and whip. Add a little heavy cream just to make it smooth. Fold in the whip cream with a spatula. (about 2 cups of heavy cream worth of whip cream) it is important to make a really stiff whip cream. This will make a really smooth watermelon whip cream filling with a strong enough watermelon flavor for the cupcake. maybe make a watermelon marshmallow filling and dyeing it pink would help. 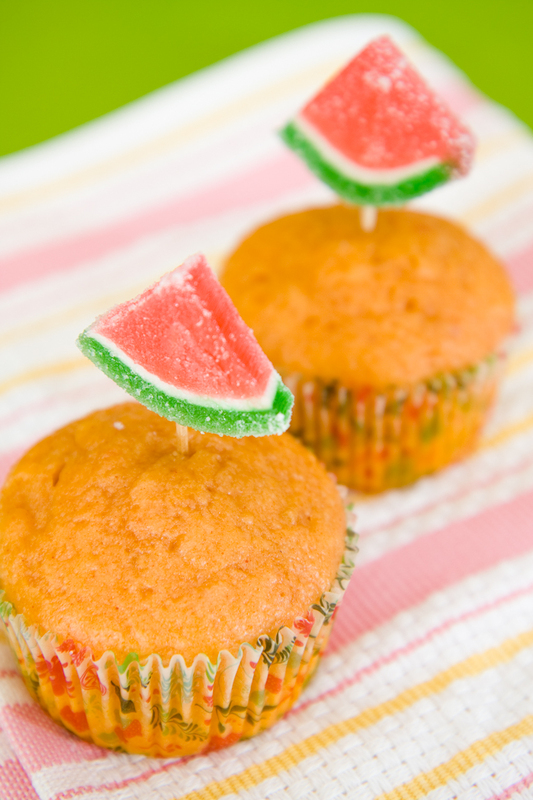 I’m researching Watermelon cupcakes on Pinterest.com & have a few recipes I’m going to try. I’ll be filling them with the above mentioned filling, too. Or, use RED RED AMERICOLOR Gel, if you really want the cake to remain red after baking. AND, sprinkle mini chocolate chips into the batter for seeds; then, mix one small box of sugarfree jello watermelon, poke tiny holes with a fork on top of your baked cakes,then dribble the jello over them. it will soak down into the cake. let them sit overnight and then frost them with an italian buttercream tinted green(rind) & a little candy watermelon slice.